Have you ever noticed that tomato stems look like stars? I've eaten many a tomato in my time, yet this was still news to me. I only noticed it when I was admiring a pleasingly robust plant in our garden. I guess I had to see the fruit en masse to make the connection. It struck me as utterly charming, this extra dose of beauty on an already pretty object. It also got me thinking that although stars are a lovely shape, I don't tend to use them often. 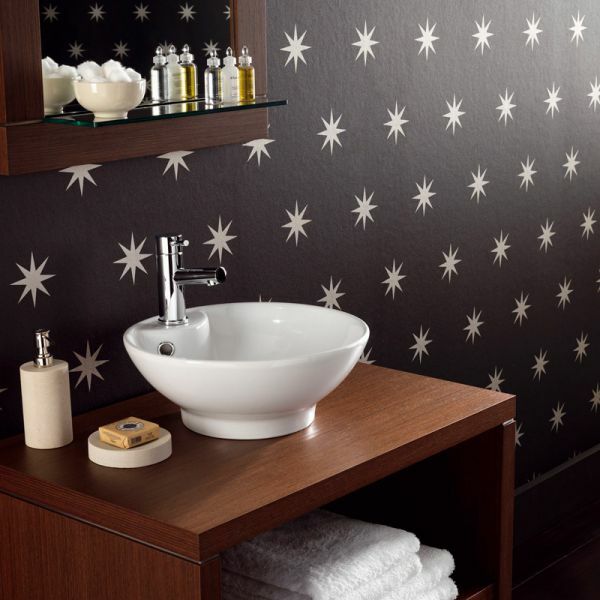 So I went in search of a great star pattern, and turned up this one: Coronata Star by Osborne & Little. It works especially well as a ceiling treatment, for obvious reasons. And of course it's also lovely on walls.